Mirka® DEOS – Closer. For perfection. 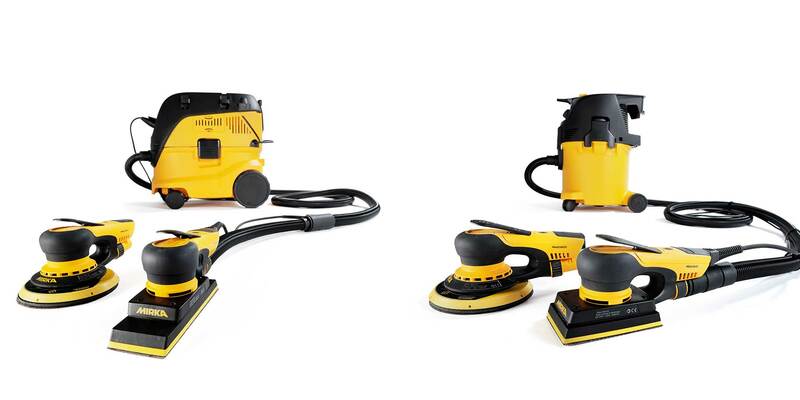 Mirka DEOS, the electric orbital sander, integrates all the innovative features that have made Mirka DEROS so popular, and more. Its high efficiency brushless motor exerts plenty of power so the sander completes jobs quickly. At only 10 cm high, the tool’s compact and very low profile gives a high maneuverability and helps deliver a precise and efficient sanding performance. 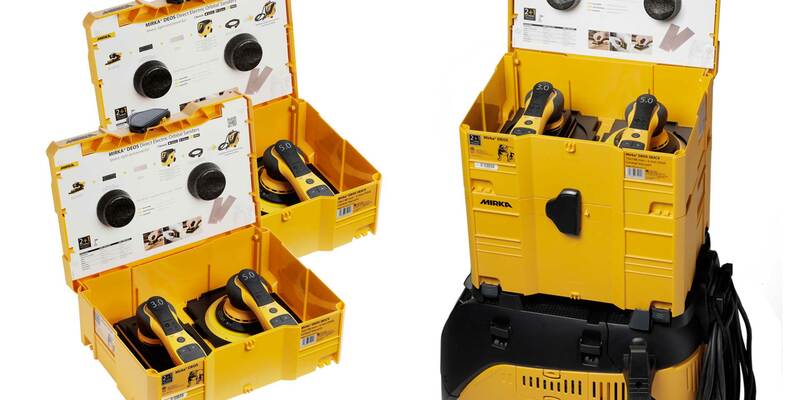 Our tools have been awarded for their innovative design and the Mirka DEOS is no exception, placing top priority on its excellent ergonomic design to ensure that the sander can be used comfortably for long periods without fatigue. The Mirka DEOS electric orbital sander is compact and very light. 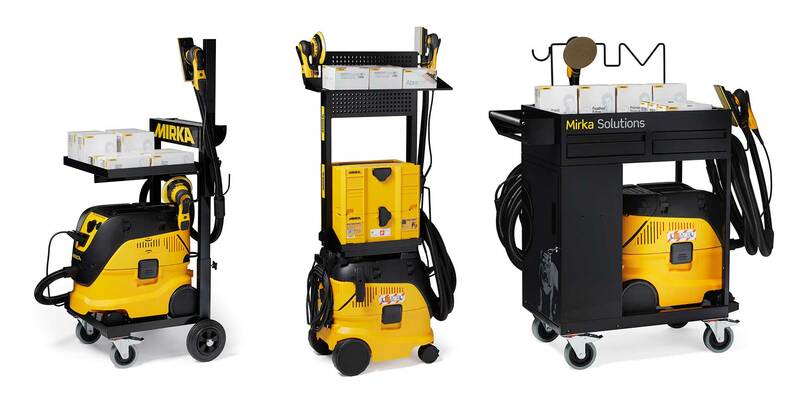 The machine is available in two dimensions: the Mirka DEOS 383CV, 2.75" x 7.75" , is designed mainly for the ART sector and the Mirka DEOS 353CV, 3" x 5", is mainly targeted at the wood and CD sectors. At Mirka we put your health in focus and we are aware of the harmful vibrations generated when working with sanders. That is why we have developed an app to respond to the growing importance of health and safety in the workplace and specifically to help workers avoid harmful vibrations. 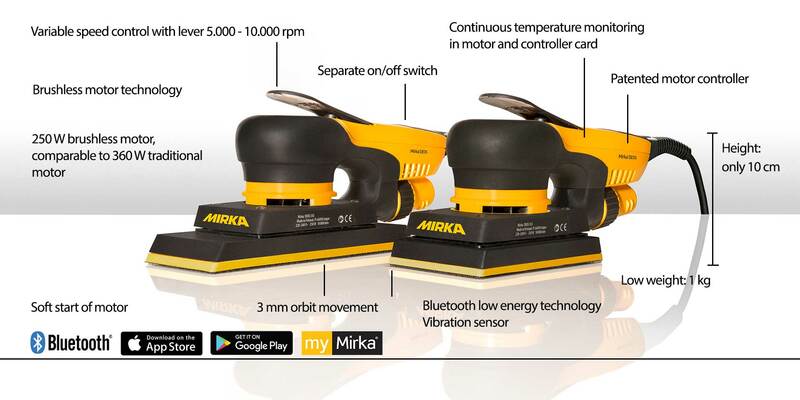 Both Mirka DEOS and Mirka DEROS are equipped with Bluetooth low energy technology. The sanders can be connected to the myMirka app via Bluetooth. myMirka is the platform providing digital services and connectivity solutions. Read more on myMirka minisite.